Now that you’ve brought your sweet, little fur ball home it is important to give him or her a happy and healthy home to grow up in. It takes plenty of work to train your puppy on the essentials in life but you can make things fun and easy when you follow our 5 tips to raising the perfect puppy. Get a Crate -Your puppy will need time to adjust to it’s new home and a crate can help provide safety, comfort and quiet that the puppy needs. Make it a fun and safe place to relax instead of a spot for punishment. Potty Train – You and your puppy will be much happier when you dedicate the time and diligence needed to house training. Stay on task and offer lots of rewards when your puppy does something right. Also remember to never punish your puppy over accidents. 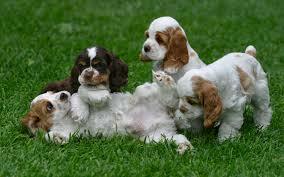 Socialize - Teach your new puppy how to be a good citizen and use good manners around other people and animals. Carry treats with you to reward your puppy for good behavior and help them associate new people and animals with good things instead of fear or shyness. No Biting - Establish your place as a leader of the pack and discipline gently when biting occurs. Be firm and tell your puppy, “No.” Then gently hold it’s mouth closed for a minute and give him a toy to play with instead. This will show your puppy how to respect and obey your commands. « Dogs in the front seat?